Boat cruising in the waters off Water Cay. 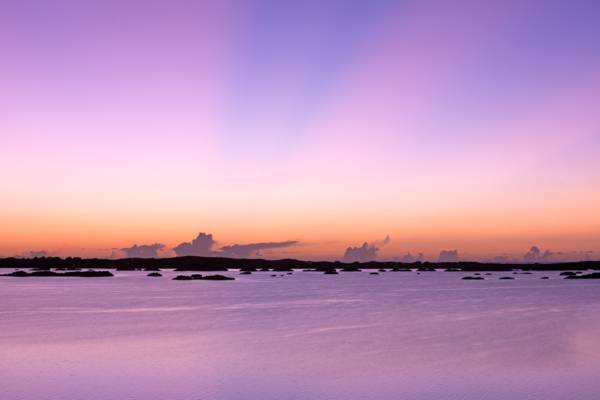 Sunset over Chalk Sound Lagoon on Providenciales. 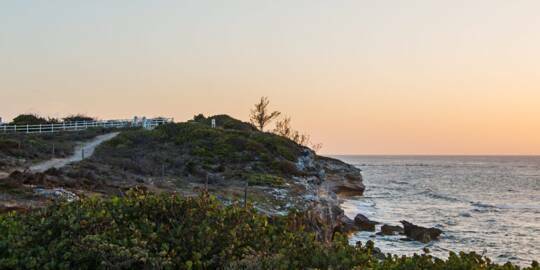 There’s a wide selection of options on Providenciales when it comes to exploring the Turks and Caicos by land, sea and air. This page covers land and air tours and day trips. 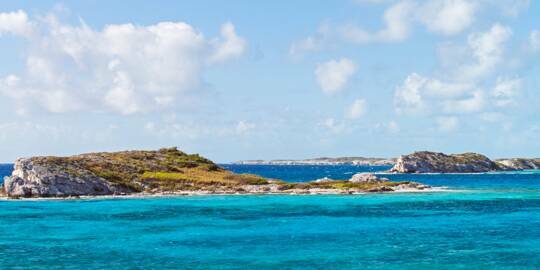 You may be interested in Providenciales Boat Cruises. Scooter, 4x4 safari and helicopter tours are the primary excursions to choose from. 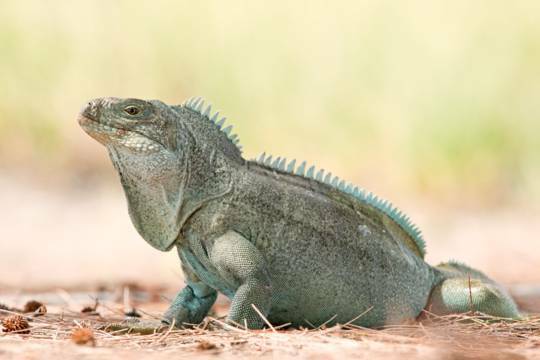 These tend to visit the central sites on the island such as Cheshire Hall Plantation, The Hole, Chalk Sound, Sapodilla Hill, and Blue Mountain. Although a relatively small country, the different islands in the Turks and Caicos each offer a unique atmosphere. 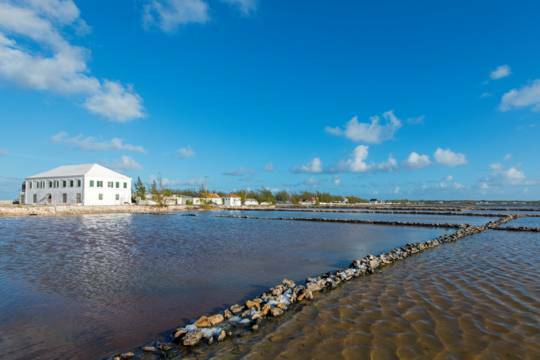 Over the last two decades, Providenciales has seen a tourism boom with the development and construction to match. The less-populated islands haven’t changed much over the years though, and offer a rare glimpse into the old tropical way of life. A day trip to one of our other inhabited islands is a tranquil and fascinating experience. Passenger ferries at Heaving Down Rock Marina on Providenciales. Plan Your Own Adventure, or Take a Tour? Day trips can either be arranged on your own, or an organised tour from a local company can be taken. If you’d simply like to see the main beaches and sights, planning your own trip will typically be the best choice. You’ll pay less and be able to spend times at the sites that interest you. 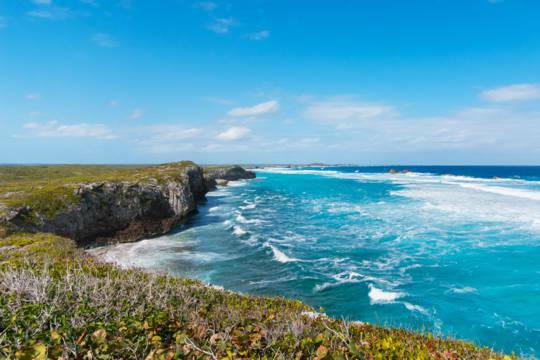 Of the inhabited islands, the green and expansive North Caicos and Middle Caicos is a great first choice. 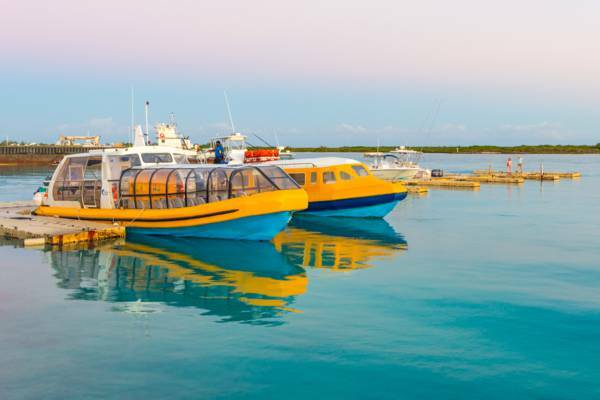 A regular passenger ferry service runs several times per day between Heaving Down Rock Marina (Walkin Marina) on Providenciales and Sandy Point Marina on North Caicos, and rental cars are easily available. A drivable causeway connects the two islands, and collectively there are many beautiful places to see. 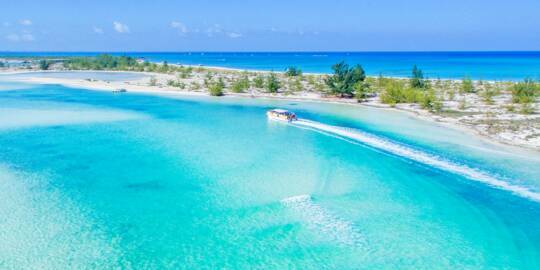 Due to the regular scheduled flights and car rental companies catering to the cruise ships, a day trip to Grand Turk is likewise easy to set up. As the political capital of the country, many historical attractions are found in Cockburn Town and on Grand Turk. 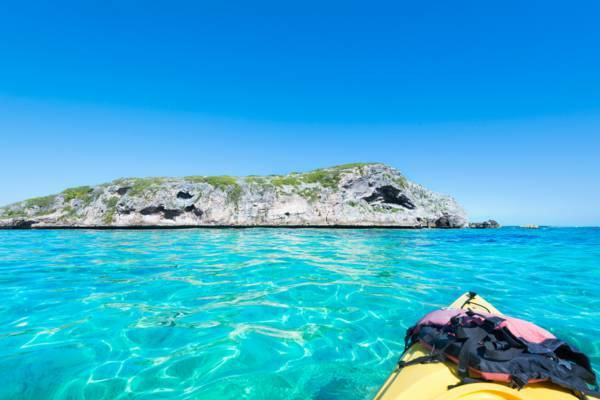 Kayaking off the remote Highas Cay near Middle Caicos. 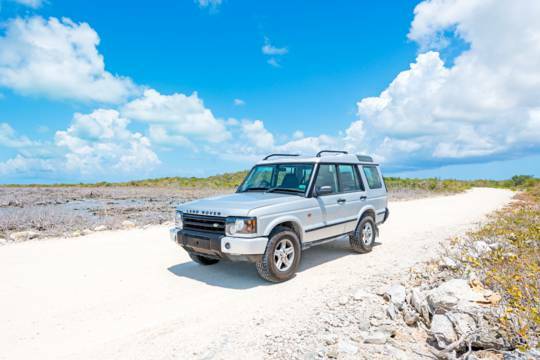 A visit to the quiet islands of South Caicos or Salt Cay can definitely be rewarding, but due to ferry and flight time constraints and the availability of rental vehicles, a little more research and planning may be necessary. In some cases, it may make sense to stay overnight. Taking a relaxing boat cruise to one of our many cays is our most popular activity. You'll have the option of a group or a private boat charter. Most of the cruises offer snorkelling, which may include diving for conch to create our famous conch salad. Alternatively, there's always the choice of a private fishing or diving charter. Large catamarans are a popular choice for boat cruises, due to the room and shallow draft afforded. 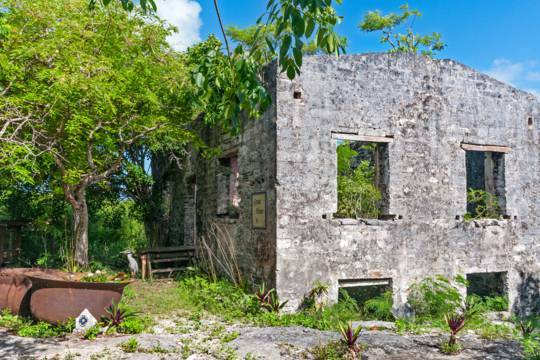 If you’d like to truly get off the beaten track and see the obscure historical and natural sites of the Turks and Caicos, we advise adventuring with qualified guides. 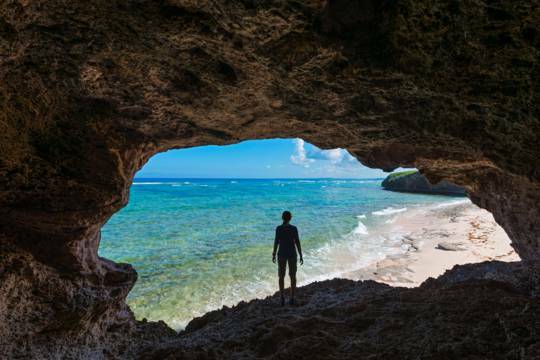 Reclaimed by the dense vegetation, many historical ruins, blue hole and cave features will be almost impossible to find without some prior knowledge. Camping sites and kayaking destinations are also greatly affected by location, and you’ll have the best experience if you adventure at the right location. Several businesses offer outdoor adventures of this type, but none are scheduled. If you're interested in this activity, ensure that you inquire and book well in advance. 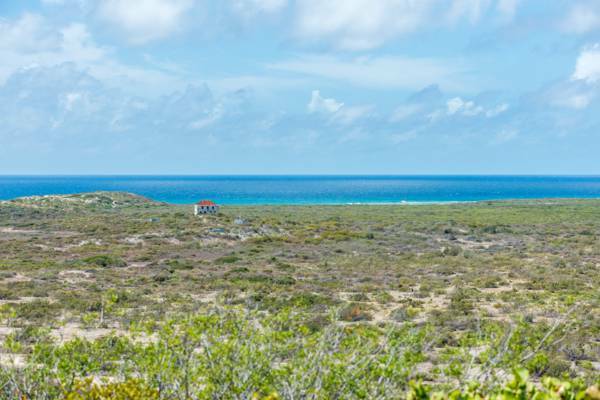 The view from the Highlands of South Caicos.